April 19th, 20th & 21st @ 11:00 AM, 1:00 PM & 2:30 PM. Come ride the train and meet the Easter Bunny! Although the bunny doesn't speak much, he is very friendly and has lost some eggs on the grounds at Whytes. Children and adults will enjoy our railroad version of this popular tradition. You can also charter the Red Caboose to meet the Easter Bunny. For more information, click here. Click here for the full schedule and ticket pricing. "Stanley The Bear" rides with the kids from the station in Port Stanley. 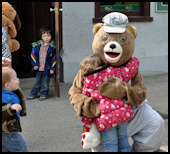 Children who bring their favourite Teddy Bear down to the train to look for spring flowers and meet Stanley the Bear, board for 1/2 price fare, $4.50. You can also charter the Red Caboose to meet the PSTR Teddy Bear. For more information, click here. Moms ride for half price with the purchase of at least one children's fare. Dads ride for half price with the purchase of at least one children's fare. Join us June 1st for a rare-mileage photo trip along the entire PSTR line, from Port Stanley to St. Thomas Talbot Street and return. Departure time is set for 10:00 a.m. from Port, arriving at the new St. Thomas Talbot St. station by noon. 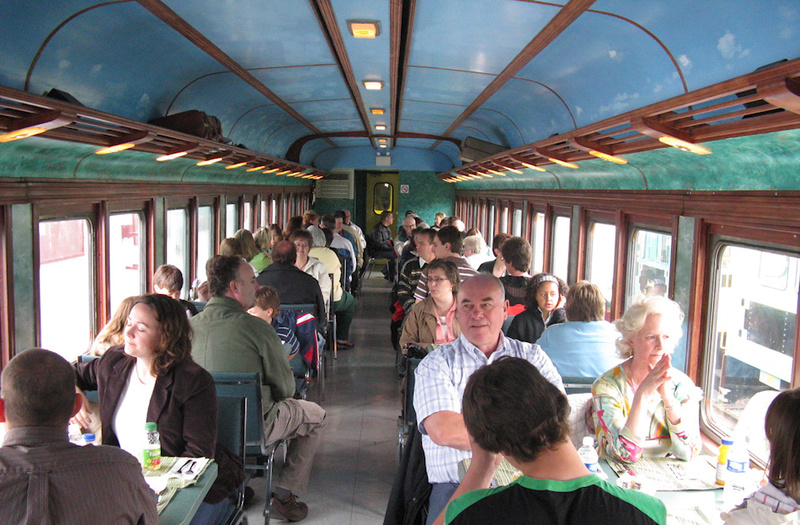 An extended stay will allow time for passengers to enjoy lunch and visits to the restored 1873 Canada Southern station and the Elgin County Railway Museum. We'll return to Port Stanley following the last service train of the day, arriving at about 3:45 p.m. Numerous runpasts and photo stops will be held in both directions. Please arrive at the station by 9:45 a.m. Trip will run rain or shine. Note: this is also a rare opportunity to ride a genuine caboose over the line, as ex CN 79305 has never been converted to a coach. Note: A minimum of 30 tickets must be sold for this trip to go ahead. Tickets must be purchased in advance. For information or reservations, contact the railway by phone at 519-782-3730. (open Saturdays and Sundays 10:00 AM to 4:00 PM) Call to reserve your ticket now! 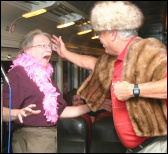 Group bookings on the train are available during our special events trains for your private party. With or without catered dinner or ride. 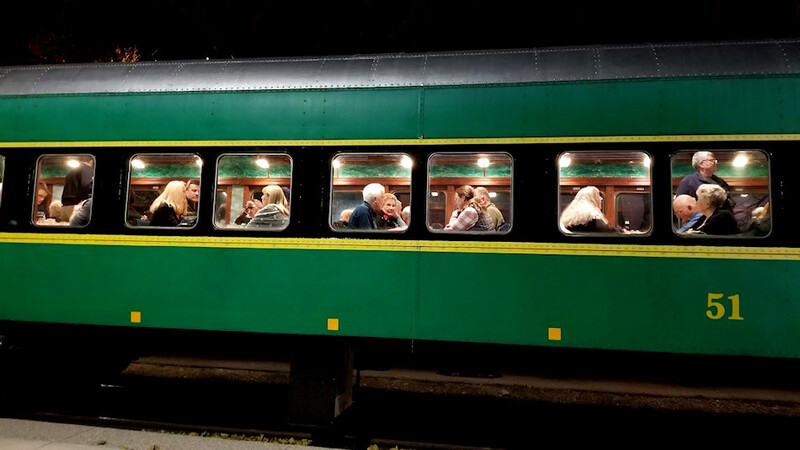 Ideal accommodation for up to 55 people in a first class, vintage, luxury railway car! An L.C.B.O. licensed car is available for your meeting also. 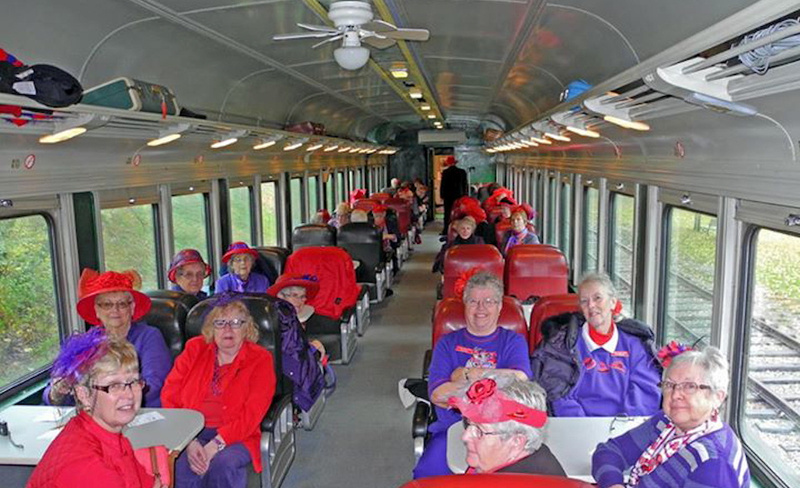 Call us for more information to help you plan your group event on the train. Train departs at 6:00 p.m. with dining on the move! "Dear Sir, I just want to thank you for all the help in accommodating us on your Murder Mystery/Dinner on October 17. Your organization skills were superb right down to the last detail. Carol Allen Group had a great time and had nothing but praise for the entire evening especially the food. Thanks again from all of us. Sincerely, Carol Allen (Group of 21)"
Come see a "who dunnit" on the train for a unique experience of drama. Reservations are required. Call 519 782 3730 to make a reservation or you can contact us here. Kids love our pumpkin patch at Whytes! 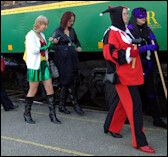 Have your corporate Christmas party on our Entertainment Train with Santa. This can be combined with or without a train ride on our regular train. Catering is available. Call our station for details and a booking. Enjoy a ride through Elgin County in early winter from the warmth of a heated car. Santa has treats for the kids! Watch your children's anticipation grow as we near our destination to meet Santa. 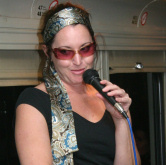 Live entertainment may appear on some trains. You can also charter the Red Caboose to meet Santa. For more information, click here.